The new EWR150E, EWR170E and EW220E wheeled excavators give contractors the mobility and production they need for urban and congested job sites. The latest wheeled excavators from Volvo Construction Equipment — the short swing EWR150E and EWR170E, and the conventional swing EW220E — give contractors three new models to choose from to take advantage of the versatility and mobility offered by wheeled machines. The EWR150E and EWR170E offer industry-leading short swing radiuses for their classes, making them the ideal machines for narrow and confined spaces, such as road jobs that require working within only one lane of traffic. At 67.7 in., the EWR150E has the shortest tail swing radius of all Tier IV Final excavators on the market. The larger EWR170E is not far behind with a 70-inch tail swing radius. For all three new excavators, Volvo offers a comprehensive portfolio of purpose-built attachments. For easy and efficient changes, the Attachment Management System stores flow and pressure settings for up to 20 different attachments. To boost productivity, customers can opt for the factory-fitted Steelwrist tiltrotator, which allows for 360-degree rotation of the attachment, as well as 45-degree tilt from the left or right sides. This drastically reduces the amount of repositioning time on the job and allows for very precise digging around utilities. With a two-finger claw on back, the Steelwrist is also ideal for placing pipe. 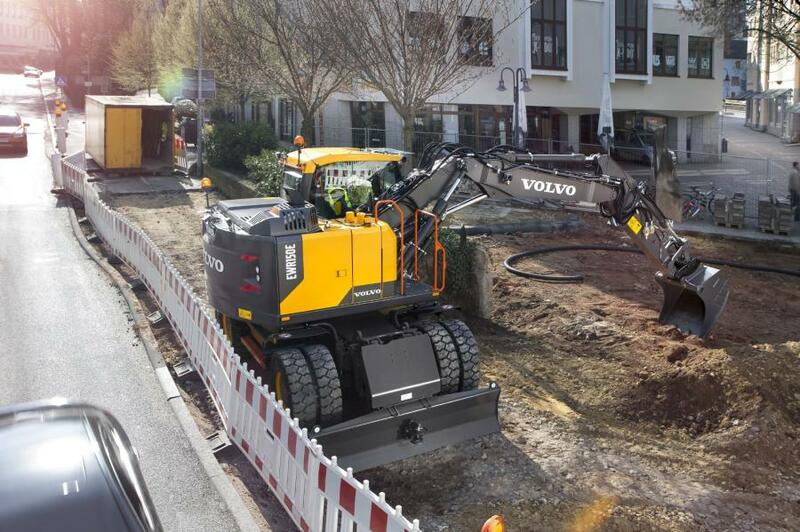 Powered by Volvo Tier IV Final engines, the wheeled excavators offer high torque at low engine rpm. Other fuel efficiency features include automatic idling and automatic engine shutdown, which engage after a pre-set amount of time. These also help to reduce machine wear. Additionally, the proprietary ECO mode from Volvo reduces fuel consumption. To boost stability when traveling at high speeds over rough terrain, the EWR150E, EWR170E and EW220E can be equipped with an optional Boom Suspension System (BSS). Complete with a hydraulic circuit and gas pressure dampers, the BSS helps absorb shocks that can unsettle the bucket load. The EWR150E is available in two undercarriage types, tailoring the weight and drawbar pull of the machine to any application. To minimize weight, a welded undercarriage with a radial blade is available. For heavy-duty work, the machine can be configured with an EW160 class undercarriage, featuring bolted-on outriggers and a parallel blade. The EWR170E and EW220E have bolted undercarriages. Volvo wheeled excavators are eligible for a free year of ActiveCare Direct, the Volvo telematics service that provides 24/7/365 machine monitoring and fleet utilization reporting directly from Volvo. ActiveCare Direct lets customers spend more time making informed fleet management decisions and less time sorting through data. The wheeled excavators' cabs are designed with generous legroom and all-around visibility due to large windows and standard rear and side view cameras. The redesigned upper frame offers a clear view to the right. The machines can also be equipped with the optional Volvo Smart View — made up of three cameras that create a bird's-eye view of the machine. This can be integrated into the machine's display or as a stand-alone screen. Volvo wheeled excavators have been upgraded with proportional-controlled joysticks now standard, allowing for more precise adjustments and finesse with attachments. Accompanying that change, an advanced, L8 joystick is being released to provide Comfort Drive Control (CDC). With CDC, the operator can steer the excavator using a roller on the joystick, and if desired, some models can be ordered without a steering wheel. The multifunction ability of the L8 joystick enables it to optionally control outriggers, blades, hydraulic cab risers and Steelwrist attachments. On the entire E-Series wheeled excavator range, greasing points have been grouped together and filters placed behind wide-opening engine doors, all accessible from ground level. With improved access to areas such as the radiators and mesh, maintenance is made easy, helping operators stay on track, even when they are on wheels. All Volvo wheeled excavators, including the new EWR150E, EWR170E and EW220E, are now backed by the Volvo Lifetime Frame and Structure Warranty, which covers the frame, boom and arm for the entirety of the initial ownership period. For more information, visit www.volvoce.com.